A number of Muslim, Arab-American and Jewish advocacy groups in the United States have celebrated what they consider to be historic victories in the U.S. midterm elections, along with rousing calls for more solidarity, unity and funding support to ride the wave to even bigger wins. This dispatch of Travel Impact Newswire compiles four such messages circulated to their members and newsletter subscribers by the Council of American Islamic Relations, the Arab-American Anti-Discrimination Committee, Muslim Advocates and Jewish Voice for Peace. Interestingly, the moderate Jewish group, Jewish Voice for Peace, is the most vocal about taking on the pro-Israel lobby and its deep-pocket financial backers such as the Macau casino baron Sheldon Adelson in advancing the Palestinian cause. Now that the tide has turned, I would strongly urge the U.S. travel industry to start supporting these causes. The momentum is unlikely to be reversed, unless the world’s most dangerous man sitting in the White House tries to distract attention by starting another wag-the-dog war. I would also urge global travel & tourism industry organisations such as the UN World Tourism Organisation, Pacific Asia Travel Association and others to end their sitting-on-the-fence policies and mainstream these issues on their agendas. In the past two years, the formerly out-of-control Trump Administration has taken numerous actions that have had a serious destabilising effect on global travel, many of which are only just beginning to be felt. The travel & tourism industry is well known for its intellectual cowardice. The long-standing tendency is to avoid all controversial issues until it becomes clear which side is winning, and then joining the bandwagon. Now, a window of opportunity has emerged for international travel organisations to put some long-overdue checks and balances into the system, and take a stand on the basis of principle not politics. The following messages are designed to set the ball rolling. Read, and heed. Washington, DC | www.adc.org | November 7, 2018 | ADC extends its congratulations to the Arab American candidates who secured victory in last night’s 2018 midterm Congressional elections. In this pivotal midterm race, the Arab American community together with other communities of color in the U.S. made history. This election had a record number of Arab and Muslim American candidates running for office in large part thanks to the exceptional rate of grassroots mobilization by the Arab American community. Arab American women, in particular, had a vital role in the unprecedented high number of women candidates that ran for office in this election. ADC congratulates Rashida Talib (MI), who is the first Palestinian and Muslim- American woman elected to the U.S. Congress as well as Ilhan Omar (WI), who is the first Somali and Muslim-American woman to win a U.S. congressional seat. Adding to this historic race is Donna Shalala (FL) winning Florida’s 27th district. 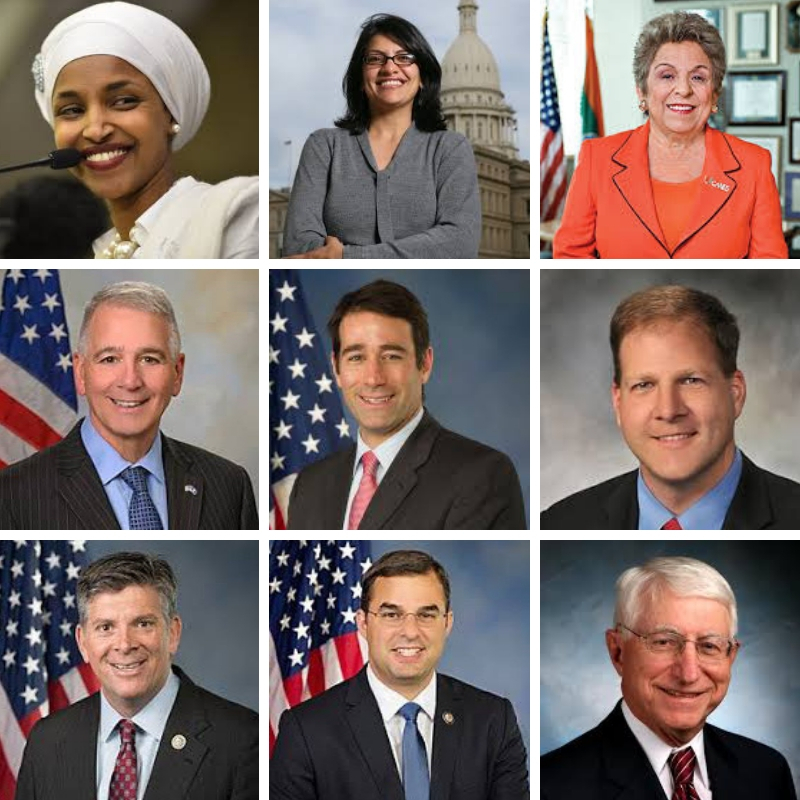 ADC takes this opportunity to congratulate all the Arab-American federal candidates that won in this election; Ralph Abraham (LA) US Congress 5th District, Darin LaHood (IL) US Congress 18th District, Garret Graves (LA) US Congress 5th District, and Justin Amish (MI) US Congress 6th District. Also, winning his re-election as New Hampshire’s Governor is Arab American Chris Sununu. ADC congratulates the countless other Arab Americans who won local municipal level elections. It is important to note that there are still several other Arab American candidates whose election results have yet to be confirmed. ADC expresses its special congratulations to ADC National Board Member Michael Saba for winning South Dakota’s Ninth District seat in the South Dakota House of Representatives. Arab American participation in the US political process is an essential part of our community continuing to contribute and build this nation. It is worth noting there were over 60 Arab American candidates running for office in local, state and federal elections. ADC takes pride in supporting Arab American leadership in the U.S political system and our community’s participation. Despite the great challenges that we are facing as a country today, I am inspired by the strength and resilience displayed by our community. This year, ADC traveled to Southern California, home to one of the largest Arab-American communities in the nation to host the ADC National Convention. After a weekend of learning, educating, organizing and strategizing, it is clear that our community is energized, mobilized, and ready to work together to achieve our shared goals. While we remain hopeful, we know we still have obstacles to overcome. Throughout the convention ADC highlighted the impact that systemic discrimination still has on our community today. We discussed the importance of combating negative portrayals of Arabs in the media especially for future generations of Arab Americans. During the convention two-time Academy Award winner Sean Penn delivered an impassioned speech that touched the audience. 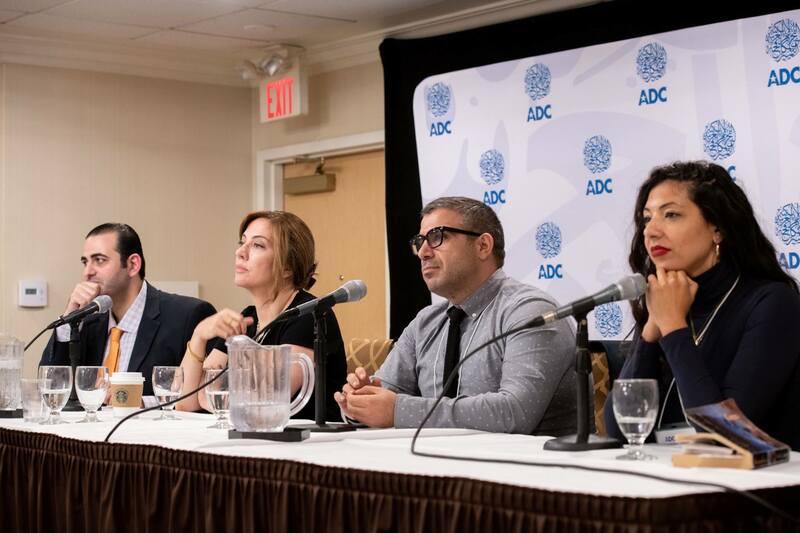 ADC also hosted our annual event reaffirming our unwavering support for Palestinian human rights and freedom. Given the current political climate of our civil rights under attack ADC is absolutely vital. ADC remains committed to protecting, empowering, and celebrating the Arab- American community. Now, I am asking you to continue to be there for Arab Americans and support ADC as you always have. Our hard work might take decades to bear fruit but together we will work for a more prosperous and just future for Arab Americans. Over the years we have learned hard and valuable lessons – we know too well that we cannot take our rights for granted. Let’s continue to work together to fight back against injustice, stand up to oppression, and empower our community to protect our rights. Tough days are ahead but I am confident that together, with you support and investment, we Arab-Americans, are up for the challenge and brighter days are ahead. Jewish Voice for Peace sees Huge Opportunity to reset US policy on Israel/Palestine. Last night, the most diverse group of Members of Congress in the history of the United States won office – including the first Palestinian-American woman ever elected! Our problems certainly haven’t disappeared (and in some districts the elections haven’t even been called yet), but the result is a spark of hope in anxious times. These new elected officials don’t just “look different” – their positions are grounded in a different vision of equality, justice, and inclusion for all people. And that creates a huge opportunity to reset US policy on Israel/Palestine. But there’s a problem. AIPAC, Sheldon Adelson, CUFI (Christians United for Israel, which is actually the largest advocacy group in the US backing Israeli policy), and even the Israeli government itself are going to put tremendous pressure on them to soft pedal, delay, or outright abandon concrete action. And unfortunately, rising antisemitism might make their job easier. So what are we doing at JVP? We’re launching a huge new effort to make support for Palestinian human rights and equality for all people of Israel/Palestine a top priority for the upcoming Congress. Will you help make that happen? We’re ready to invest big – in fact, we just hired a new Congressional Organizer dedicated completely to mobilizing our members around legislative change. But because the results from yesterday were frankly mixed, we’re worried some of these newly elected officials might be more reluctant to take concrete action – even when their hearts are in the right place. Can you help us now raise $25,000 before Friday so we can educate these new representatives about the reality of life for Palestinians in apartheid Israel, and inspire them to be the heroes we need to reset America’s relationship with Palestinians? We can’t underestimate our role right now – when progressives decide to take a stand for equality in Israel/Palestine, they need to know the fastest-growing Jewish organization in the US has their back. I’m sure I don’t need to recite for you all the times otherwise progressive politicians have treated support for basic Palestinian rights as either too toxic to touch, too incompatible with maintaining Jewish support, or too easy to ignore. Just last week, self-professed progressive leader Senator Cory Booker threw Palestinians – and justice-minded Jews like me – under the bus when he “responded” to the antisemitic massacre in Pittsburgh by signing onto an AIPAC-sponsored bill attacking advocates for Palestinian rights. And we have just eight weeks to get it all done before they take office. It’s an enormous lift for our small team. Politically, we’re more of a force than we’ve ever been, and this is an enormous opportunity to help win co-sponsors on historic legislation defending Palestinian human rights, loosen AIPAC, CUFI, and Sheldon Adelson’s grip on US Israel policy, and back up the brave elected officials who are going to do the right thing with their power. But we’ve got to move fast — and we need to raise $25,000 by Friday to make it happen. Donate now to help us re-set the US relationship with Palestine before AIPAC, the arms lobby, and Adelson get to them. This morning, I’m waking up with a new hope for our country. The last two years have been gut-wrenching but yesterday, the American people finally had their say and rejected the politics of hate and division. We even elected the first two Muslim congresswomen along with many other history-making candidates for women, people of color and the LGBTQ community. Let’s be clear: One house can stop bad laws and hold the Trump administration accountable, but it requires each of us to push Congress to act. That is why at Muslim Advocates we’re getting right to work preparing an agenda for the next Congress. Over the past two years together, we have proven that even in this toxic environment, wins for dignity and equality are possible. With full Republican control, we were able to torpedo bigoted nominees like Mark Green for army secretary, force Trump officials like Sebastian Gorka to resign, challenge bad laws and policies like the Trump family separation policy in the courts, and successfully challenge corporations like Hyatt hotels to ban hate groups. Now imagine what we can do with the U.S. House of Representatives on our side. The party in power can hold hearings, issue subpoenas and pass (or stop) legislation. Muslim Advocates has been readying a roadmap for the next Congress that includes stopping legislative proposals that erode our civil rights, overturning the Muslim Ban, and oversight hearings on the President’s repeated attacks on the rule of law. With your support, we will expand our policy engagement and outreach team — added capacity that is crucial to engage allies and maximize pressure on Congress to hold Trump accountable, stop bad laws and reverse the greatest rollback to civil and human rights we’ve witnessed in decades. With you by our side, we will deepen our efforts to fight hate and discrimination at every turn. And together we will win. (WASHINGTON, D.C., 11/6/18) – The Council on American-Islamic Relations (CAIR), the nation’s largest Muslim advocacy and civil rights group, tonight welcomed a historic string of victories by American Muslim candidates nationwide in today’s midterm general elections. Ilhan Omar won in Minnesota’s 5th Congressional District and Rashida Tlaib won in Michigan’s 13th Congressional District. They are the first Muslim women elected to Congress. In Indiana, Rep. André Carson (D) won his re-election bid for the 7th District. More American Muslim election victories are expected as results are announced. CAIR has been live tweeting reactions to general election results. Follow CAIR’s Twitter feed at @CAIRNational and Facebook feed at www.facebook.com/CAIRNational and follow hashtags #MuslimsVote and #MyMuslimVote. Many CAIR chapters have also posted reactions to local and national election results using their social media channels. “We congratulate the successful American Muslim candidates nationwide, whose victories demonstrate the strength of our political system and the growing positive role of American Muslims at every level of our society,” said CAIR National Executive Director Nihad Awad. More than 90 American Muslims ran for office this year at the local, state and national level, and according to CAIR and Jetpac, a group that seeks to build a strong American Muslim political infrastructure and increase American Muslims’ influence and engagement. More than 40 American Muslim candidates advanced to the midterm elections. Next week, CAIR and Jetpac will release a joint report surveying successful campaigns and organizing strategies employed by American Muslim candidates. Its findings include a trend that American Muslim candidates and campaigns prioritized broad social justice-oriented policies such as equitable housing, healthcare, and employment and did so by working across traditional political boundaries and through various levels of office. This year, CAIR has worked to mobilize community members to vote during the primary and general elections. (WASHINGTON, D.C., 11/7/18) – The Council on American-Islamic Relations (CAIR), the nation’s largest Muslim civil rights and advocacy organization, today released the results of its “American Muslim Voters and the 2018 Midterm Election” exit poll indicating that 95 percent of eligible Muslim voters turned out at the polls. Seventy-eight percent of Muslim voters cast ballots for Democratic Party candidates and 17 percent for Republican Party candidates. CAIR’s survey results were drawn from a random sample telephone survey of 1,027 American Muslim registered voters conducted by an independent polling firm. Survey participants were drawn from a database of more than 250,000 Muslim voter households. Calls were conducted on the evening of November 6. Respondents included 650 men and 377 women from across the nation. The poll’s margin of error is +/- 3.1%, with a confidence level of +/- 95%. • 95% of registered Muslim voters cast ballots in this year’s midterm election. • 78% of registered Muslim voters who primarily voted for Democratic Party candidates thought Islamophobia has increased in the past year. Conversely, only 33% of registered Muslim voters who primarily voted for Republican Party candidates thought Islamophobia has increased in the past year. 20% have donated to a political or social campaign. 25% have donated their time by volunteering with a local charity or civic-minded or religious organization. 18% have donated their expertise by using their skills and/or network to advance social/political engagement. 37% have primarily been involved in another way. • Muslim voters who primarily voted for Republican Party candidates were more likely to contribute money as their primary form of involvement, while Muslim voters who primarily voted for Democratic Party candidates were more likely to volunteer with a local charity or civically minded or religious organization. • 15% of Muslim voters are very involved in activities at their mosque or Islamic Center, while 26% are somewhat involved, 27% are not very involved, 28% are not at all involved, and 4% refused to answer. • 49% of Muslim voters who primarily voted for Republican Party candidates were more likely to not at all be involved in activities at the mosque or Islamic Center in comparison to their Democratic Party supporting counterparts (23%). • 63% of survey respondents identified as male and 37% as female. • Muslim women are more likely to support Democratic Party candidates and less likely to support Republican Party candidates than their male counterparts. CAIR and its chapters nationwide have mobilized community members to vote during the primary and general elections. Next week, CAIR and Jetpac, a group that seeks to build a strong American Muslim political infrastructure and increase American Muslims’ influence and engagement, will release a joint report surveying successful campaigns and organizing strategies employed by American Muslim candidates. Its findings include a trend that American Muslim candidates and campaigns prioritized broad social justice-oriented policies such as equitable housing, healthcare, and employment and did so by working across traditional political boundaries and through various levels of office.